Starbucks Veranda and Bright Sky is famous among lighter roasted coffee drinkers. Made by the popular coffeehouse chain Starbucks, these coffee is guaranteed to deliver a good experience. If you are confused about what to choose or want to know more about them, go ahead and read our article below. Starbucks is a coffee company and coffeehouse chain originated from America and was found in Seattle, Washington in 1971. Starbucks has many coffee houses spread all around the world and by 2017; the company operates in more than 27 thousands locations worldwide. In these locations Starbucks offer hot and cold drinks, whole bean coffee, microground instant coffee, cafe latte, espresso, full and loose-leaf teas, Frappuccino beverages, Fresh Juices, La Boulange pastries and some kind of snacks like crackers and chips. Starbucks offer varieties of Ground coffee in Blonde Roast, Medium Roast, Dark Roast, and Flavored coffee categories. In the Blonde Roast category there are two variants, veranda and Bright Sky Blend. Blonde Roast name is only used by Starbucks to refer their Lighter Roast. Different from their traditional Dark Roast and the taste of pine ciders, Starbucks offer a lighter taste, subtle and soft with mellow acidity and surprisingly also managed to sneak a nice caramel like sweetness. Starbucks Veranda Blend is blends of premium Latin American coffee beans, made with light roast to provide the drinker a very mellow and relaxed cup of coffee. Veranda blend has a hint of soft cocoa and lightly toasted nuts when brewed. Starbucks offer Veranda Blend in the form of ground coffee, K-Cup Pods, Verismo Pods, VIA instant coffee, and whole bean. If you are interested on Latin American coffee, read our article on Folgers vs Starbucks here. Starbucks veranda was inspired by Latin America coffee farmers who lived on the same land, where their coffee grows. Their tradition of sipping coffee in their veranda while looking at their coffee trees rolling out in the distance is why this coffee was named Veranda Blend. Coffee that was enjoyed on such moments are commonly lightly roasted. Starbucks stated that they need more than 80 tries to get the perfect mellow and flavorful with a nice softness brewed coffee. Starbucks Bright Sky Blend is another variant in the Blonde Roast category of Starbucks blend coffee. As you can expect, Bright Sky Blend has a light and nutty flavor that you will notice when taking a sip of this coffee. You can feel that there is definitely a hint of peanut in the coffee, even though there is no peanut in it. Bright Sky Blend has a smooth nutty flavor and buttery that will give you a nice long finish to it. 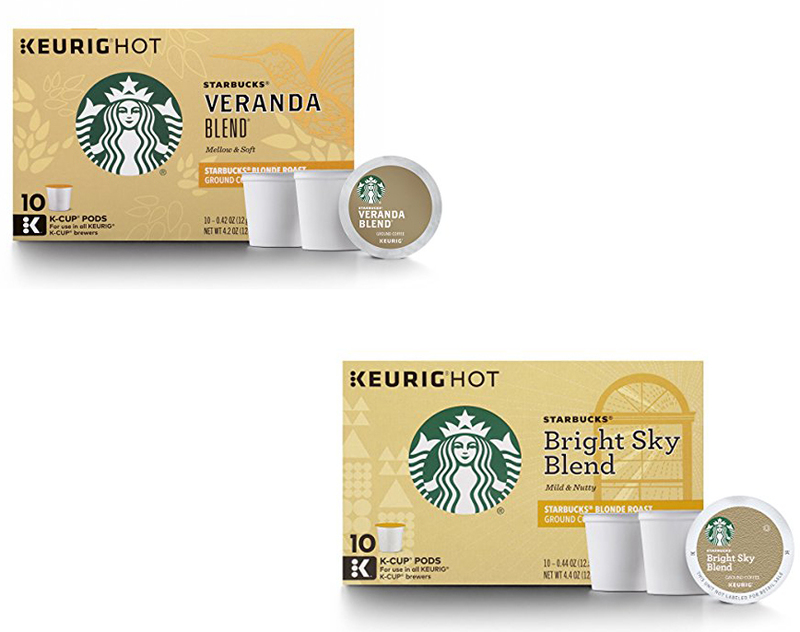 Unlike Veranda Blend, Bright Sky Blend only available in ground coffee and K-Cup pods. The coffee beans used to make this variants is from Latin America and was carefully crafted and roasted by Starbucks just enough to bring out the nutty and a touch of acidity that will culminating in a crisp and pleasant finish. As we knew, both of Veranda and Bright Sky Blend is the lighter roast variant of Starbucks coffee and also originated from Latin America. Bound by lighter roast, both of them are equally high in acidity and still have the fresh original taste of the coffee bean. What makes them different is the taste, even though they equally light toasted, Bright Sky blend has lot of nuttiness to the aroma and despite having a high level of acidity it does not have the same tangy or citrus lightly roasted peanut. The taste also shown to develop some brown sugar flavors and taste just slightly darker roasted than Veranda. In our opinion, Bright Sky is more suitable for people who want to sip a lighter toasted coffee without the tanginess while Veranda is more suitable for people who like the taste of citrus lightly roasted peanut in their coffee. In the end, your personal preference is what matter the most.